Beautiful colours including silk white that make the shutters a perfect choice for interior windows. This enhances the natural beauty of a home because the colour blends well with interior décor. Amazing styles that allow you to choose the best shutters for your window types. You will always find a style that matches your needs best whether you want the shutters for a square bay window, patio, casement window, a traditional sash or French design windows that come with multi-paned bays. 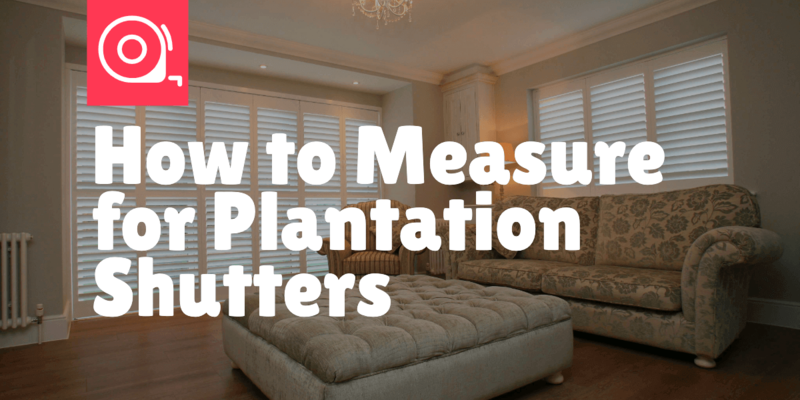 However, to get the best results when installing plantation shutters, it is imperative that you understand how to measure for plantation shutters. Generally, a standard window style easily accommodates a basic plantation shutter design. This means it includes a set of carefully measured panels that will match your window layout. 1. The half-height shutters that only fit a fraction of a window while leaving the top side open. 2. Full height shutters come with horizontal middle rails and they can be moved within different single sections. 3. Top opening is a tier on tier and it offers you an option of opening different sections. There are also solid shaker shutters and plantation louvre shutters. The latter is measured exclusively to let in light without opening them. Solid shutters, on the other hand, are measured to provide space for you to open during the day to allow in light. Therefore, based on the style, design, and size of your window, you should know how to measure for shutters. This will help to let in sufficient amount of light, provide the needed visibility in the room, and to gain privacy. Your window height and width. The unique specifications of your windows. Always start by measuring the width and height of your windows in several places while taking note of every detail. Use the smallest size. Take your measurements to the position where the plantation shutter frame will be fitted. Normally, this is L frame and it is usually 46mm deep. Take note of any protruding handles from the window. If need be, use a larger frame and spacer patterns to ensure that the measurements you get are accurate. This further prevents slats from hitting the handles of your windows. Most importantly, use measuring templates to clearly view frame and slat depths. Check how upright and levelled your window is. Measure your shutters across the diagonal of the frame to determine how square it is. If your window has a rail, you want to match horizontal rails when measuring for shutters. Therefore, take measurements from the window sill straight to the middle of the rail on the window. If your shutters have the tier on tier on design, carefully measure to the top rail. Across the bottom of your window inside the recess. On top of the window. You will also measure the height of the window in the middle, on top of the window and across the bottom. Take the smallest width and height measurements for more accuracy. The measuring is not only designed for quality fitting, but it also helps you in calculating the total cost of purchasing your shutters. Keep in mind that shutters are usually priced in square meters and the hinge sections or panels that you settle for. As mentioned earlier, plantation shutters are available in different styles and designs. You will also find awkward bays, shapes and sizes. In such a case, the general width and height are needed for quality installation and accurate pricing. For curves and angles that require detailed drawings and templates, a professional shutter installer is a right person to approach as the expert understands how to measure windows for plantation shutters for a professional, ideal and perfect finish. When measuring for interior plantation shutters, you need to measure the width on top of your recess, the bottom and the middle. Take note of the measurements and any variations. Use the smallest measurements of the width, middle and bottom when ordering your shutters. You also need to measure the length of your window. Take measurements at three points on the window recess including the middle, right and left. Use the smallest measurement also known as the drop measurement because the shutter will definitely drop when you extend it. However, ensure it is long enough to provide quality coverage to the whole window. Measure the width of your window frame, add an additional 120mm to the measurement. This gives an overlap of 60mm on either side of the window. It also ensures that your window is well covered by the shutter. Measure the drop of the shutter. Be keen on how far you will need the shutter to drop when you fully extend it. Often, for a recess fit, simply take measurements from your top fitting to the place where the shutter will drop. Ensure that there are no objects that will obstruct the shutters. Ideally, your shutters should not in any way obscure your window when you raise it. In this case, it is vital that you consider an extra overlap at the bottom or top. Just like the width of the windows, it is imperative that you add an extra 120mm at the bottom and 60mm on top. It provides the needed overlap on the length. A point to note when taking your measurements is that you need to measure three different places on the width. This is because windows are not always perfect, therefore, the largest measurements help to ensure the best, perfect and ideal fit during installation. When measuring windows for shutters especially for quality lighting, roller and harmony blinds, take the width measurements on top of the window across. This ensures the best fit. It is recommendable that you consider the type of your window. This is because there are different types of plantation shutter designs and styles in the market. Always choose and measure for shutters that will fit perfectly well in your window. If you have bay windows, a specific fitting or measurement is essential. Remember, bay windows are available in an array of designs including square bay windows, splay bay, open bay and angled bay. In this case, it is imperative to have specific measurements in regards to the size of the shutters you want. You also need to consider whether you are measuring shutters for a window that will fit well or not. Think of possible obstructions that may need an extra width on your shutter brackets. This includes window handles, air vents and locks that may stick out from your window. Choose the desired style of plantation shutters. Reduce the cost of purchasing and installing shutters. It offers you peace of mind knowing that you have a clear and detailed measuring of your shutters. You can measure the windows on your own or settle for skilled fitting. Either way, ensure accurate measurements to prevent incorrect ordering of shutters, manufacturing issues or faulty installations. Keep in mind that for the best and authentic fitting, you need to measure your window opening. The width of your shutters, on the other hand, should always be half of the total width of your window. Last but not least, always check the squareness of your window by measuring different diagonal points of your window. Do not forget your window opening as it allows you to get the correct measurements for shutter size for windows that will fit well. To ensure your shutters work effortlessly, smoothly and as desired after installation, do not make any adjustments to your window size when taking measurements. You can also get quality shutters at Lifestyle Shutters & Blinds, and hire the experts for installation services that are second to none.